Years ago when I was visiting my sister in Portland, Oregon for Christmas, she made me the most delicious cake I have ever had. That was back in the day before I was vegan, so now I've tried to make a new version of it - vegan and gluten-free! This cake may take a while if you want to get it right. I made a layer and then put it in the freezer before adding the next one. The base is a very dense chocolate torte which is then layered with a lemon custard, another thin layer of chocolate torte, then the chocolate avocado mousse for the finish. The first time I make a recipe I usually get carried away and completely forget to write down the ingredients. Not this time! I somewhat diligently took notes. Cut a circle from wax paper that is approximately the size and shape of your tart pan and set aside. To make chocolate torte: Mix together almond flour, chia seeds, hazelnuts, cacao beans, salt and cacao powder. Melt coconut oil in saucepan. Add melted coconut oil, maple syrup, vanilla and dates to dry ingredients and mix well. Press chocolate torte mixture in a tart pan so that it creates a thin layer (about 1/2 inch), and put it in the freezer. 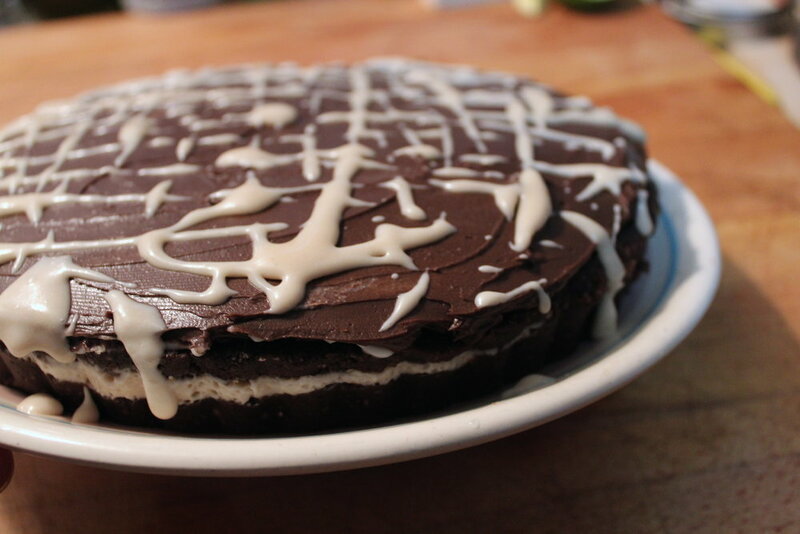 Tip: I like to put the torte into the pan with a spoon, cover it with wax paper and then even it out with my hands. This way the dough doesn't stick to your fingers and it creates a smooth base for the next layer. To make the lemon custard: Strain the cashews from the water they've been soaking in. Rinse. Melt the coconut oil and add it to the blender with all of the ingredients. Blend away! Pour the lemon custard over the chocolate torte in your tart pan. Leave a little extra to use as a garnish if you like. Put it back in the freezer for 1-2 hours. Meanwhile, spread a thin layer of the chocolate torte dough onto your wax paper circle, put it in the freezer for an hour. When your layer of lemon custard has set up (it shouldn't be hard as a rock), remove it from the freezer along with the chocolate torte layer on wax paper. Place the torte layer onto the lemon custard, wax side up, and peel away the wax paper. Press down very gently - if you have any extra torte dough, you can use it to fill in the edges and smooth out the top layer. Place the whole cake back in the freezer. To make the chocolate avocado mousse: melt the chocolate, cacao, cinnamon and coconut oil in a saucepan on low heat. Blend together the avocado, maple syrup, vanilla and salt. Add the melted coconut and cacao mixture to the blender and blend thoroughly until creamy. Allow the mousse to thicken in the fridge for 20 minutes. It should be a thick, frosting-like texture. Remove the cake from the freezer and separate it from the tart pan. Add a smooth, thick layer of the chocolate mousse. Garnish with lemon custard and toasted coconut. Leave in the fridge or freezer until it's time to eat!